In a pot, place the oil and flour. Over low heat, sauté the flour with oil for about 3 minutes until its color changes to yellow. Then add tomatoes and tomato paste and sauté for 3 minutes. Add cold water. Stir constantly over high medium heat. Use a blender in order to make it smoother, if necessary. Then add milk, salt and sugar. When it boils add the vermicelli (optional) and turn the heat low. Simmer for 6-8 minutes until the vermicelli are cooked. Serve warm and with shredded cheese on top. Bir tencereye sivi yagi ve unu alin ve unun rengi sarimtrak olana dek kisik ateste kavurun. (~3 dakika) Ardindan domatesleri ve domates salcasini ilave edip 3 dakika daha kavurun. Biraz karistirip soguk suyu koyun ve orta ateste karistirmaya baslayin. Eger topaklanma olursa blendir ile karistirip puruzsuz bir kivam elde edebilirsiniz. sut, tuz ve sekeri ilave edin ve kaynayana dek bekleyin. Kaynamaya baslayinca tel sehriyeleri ilave edin (istege bagli) ve kisik ateste 6-8 dakika, sehriyeler pisene dek pisirin. Servis tabagina aldiktan sonra uzerine rendelenmis kasar peyniri koyarak servis edin. Merhaba! 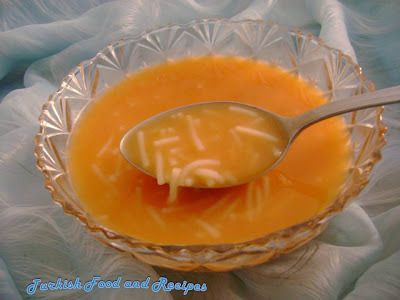 I just cooked this soup yesterday and my husband (who is Turkish) was surprised. I mostly cook rssian food, so he was surprised to taste something that tasted "real turkish" as he said..Thank you for your wonderful recepies..I keep reading..
what kind of oil you use for this reciepe please? I usually prefer canola oil. I just made this with fresh summer tomatoes and to accompany grilled cheese sandwiches. It is oh so delicious! I am loving trying your recipes as we are an American-Turkish household and it is very helpful to me! Thank you for sharing your recipes!